The British funk band Kokomo formed in the Seventies. 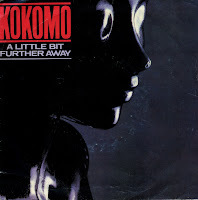 They released their debut album 'Kokomo' in 1975. The second album 'Rise & shine' appeared two years later and the third album, again titled 'Kokomo' came out in 1982. This album contained the hit single 'A little bit further away', a beautiful soul song with vocal harmonies and a very early Eighties soul music backing. While not a big hit in the UK, it peaked at number 4 in the Netherlands. I got to know the song thanks to a compilation cd which I bought in the late Eighties. Now I've finally got the original single as well.